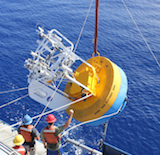 As part of the SPURS (Salinity Processes in the Upper Ocean Regional Study) project, the Upper Ocean Processes Group at WHOI deployed a surface mooring at approximately 24.5N, 38 W, in the salinity maximum region of the subtropical North Atlantic. The buoy collected data from September 2012 until its recovery in September 2013. A second buoy was deployed from August 24, 2016 to November 7, 2017 near 10N, 125W in the Pacific. The focal point of the study is the center of the low surface salinity belt associated with the heavy rainfall of the intertropical convergence zone. The SPURS buoys were each equipped with two ASIMet systems and about 60 ocean sensors. 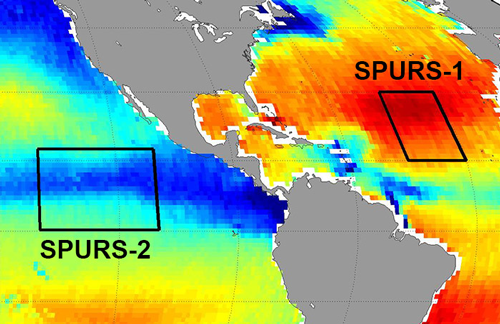 Meteorological data, preliminary surface flux data and subsurface temperature and salinity data from SPURS I and II are available under the SPURS 1 and SPURS II tabs, above. Additional data sets may be published here as soon as they are prepared for publication. Funding for this project was provided by the NASA Physical Oceanography Program. Physical Oceanography Department | Contact Us | Site Map | Copyright ©2009 Woods Hole Oceanographic Institution, All Rights Reserved.